So I’ve just gotten back from the cinema, and what was actually a fairly decent film! I’ll try not to give too much away, but lets talk a bit about the story here. It’s been thirty years since the fall of the Empire at Endor, and something called the First Order has risen up to replace it, led by the mysterious Supreme Leader Snoke. The film opens with the First Order on the trail of an artifact that turns out to be a map to the whereabouts of Luke Skywalker, who has simply vanished from the galaxy. 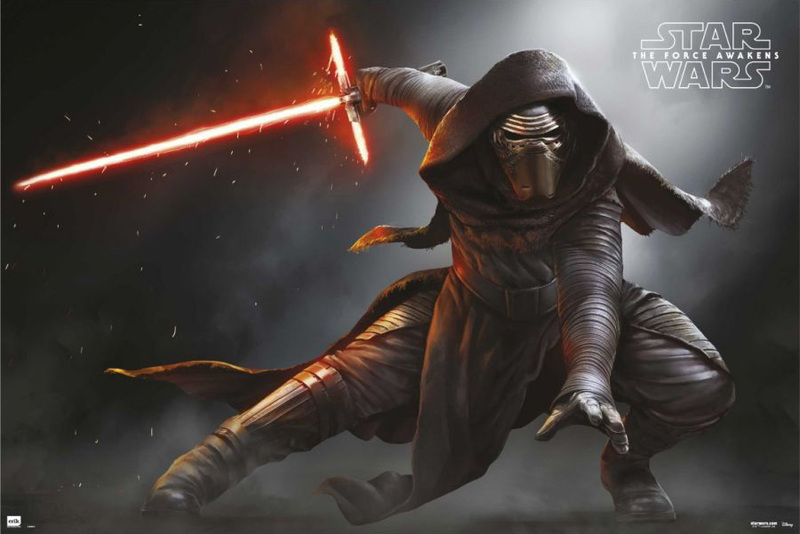 The stormtroopers are led by Kylo Ren, a Dark Side warrior with the infamous crossguard lightsaber. They manage to capture the Resistance fighter Poe Dameron, who hid the map inside his droid BB-8, and during the fight one of the stormtroopers begins to have doubts about his calling. He eventually rescues Poe, and during their escape they’re shot down over the planet Jakku. On the planet, we’re introduced to the scavenger Rey, who has hooked up with BB-8, and soon meets up with the stormtrooper deserter, now known as Finn. When the First Order show up on the trail of the droid, Finn and Rey (and the droid) escape in the Millennium Falcon, which is subsequently captured by none other than its former pilots, Han Solo and Chewbacca. They agree to help the two get BB-8 to the Resistance, going to an old contact of Han’s called Maz Kanata on the planet Takodana. Unfortunately, they’re recognised and the First Order again attempt to capture the droid, while the Resistance arrive to help them escape. During the attack, Kylo Ren manages to capture Rey, and takes her back to the First Order’s headquarters planet, Starkiller Base. The planet has been crafted into a superweapon that is capable of destroying multiple worlds at once through hyperspace, and is unleashed on the planets of the New Republic during a rally there. 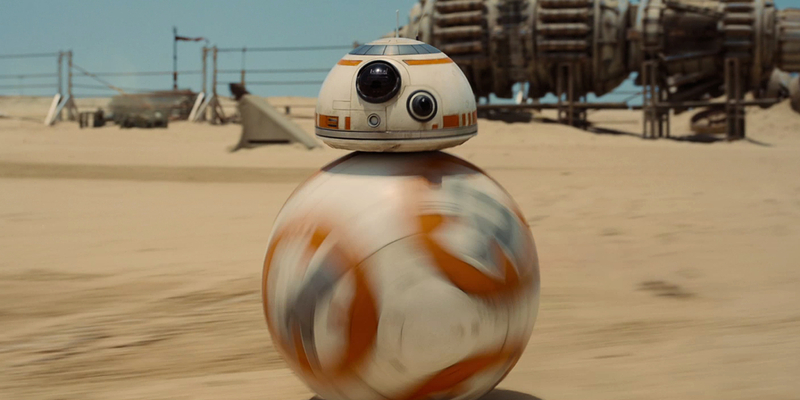 The Resistance, based on D’Qar, begins to analyze the data from BB-8, and Han and Leia are reunited. Finn volunteers to help destroy Starkiller Base, using his insider knowledge, before the First Order can use the weapon to destroy the Resistance too. Han and Chewie fly to the base in advance of a Resistance squadron, and attempt to de-stabilize the weapon while rescuing Rey. They are ultimately successful, and during the escape, it is revealed that Rey is Force sensitive. Amid the triumph of the Resistance, a long-dormant R2-D2 awakens and, together with BB-8, provides the map that leads to Luke. The film ends with Rey seeking Luke out on a desolate island on a water world. As I said at the beginning, I really liked this film. I think this was because I was prepared to hate it. Now, let me just say this first: the film felt weird. It didn’t feel like a Star Wars film, I think in part because we saw none of the familiar planets. Sure, we’re about done with Tatooine by now, but having no mention of anything familiar made me feel a little lost, somehow. More than anything, however, I felt the film tried to tell too much story without providing enough substance. It feels a lot like the thirty years between Jedi and this have almost been ignored, or glossed over, or something. Unfortunately, there’s a lot of story that has obviously passed in that time, and it’s almost unsettling to think that those years may be written off. While we still have a lot to learn about the nature of the First Order, a possible Imperial Remnant, the Resistance and the New Republic all as separate entities, the interpersonal relationships are discussed here, meaning if we were to go back to see those events (either in novel form or TV series or whatever), we’d be back with a prequel situation. There are a lot of throwbacks to the original trilogy, in fact too many. The story has too many echoes of this – hiding critical information in droids, planet-destroying weapons, yadda yadda yadda. The story is interesting, don’t get me wrong, but it does feel a little stale. There’s also the fact of the major plot-point of Luke hiding at the end of a series of Jedi Temples, leaving a piecemeal map to his whereabouts. This just seems patently ridiculous – Luke, if we remember, is the one who gave himself up to Vader and the Emperor in Jedi, knowing it might kill him, in order to save his friends in the rebellion. Now we have to believe he’s hidden himself away because of a fight with some dark Jedi? The Luke of the classic trilogy didn’t exactly run away from a fight. But even if we assume he’s hiding because he feels he’s failed to bring about the return of the Jedi Order, he left a map to his whereabouts? It’s a little too silly for me. While all of this might seem a bit like I’m down on the film, however, I did actually like it. Indeed, almost because of some of these things – I mean, the universe feels so different, which is a bad thing for the part of me that has been a Star Wars fan for decades, but it excites me because it feels really quite fresh and alive! Having grown up with all of the books and comics, this film doesn’t feel like the Star Wars story that I’d expected at this point in the timeline. But that’s not a bad thing. I said the story feels like it’s rehashing the original trilogy to some degree, but of course so many of the storylines from the expanded universe feel so samey, this new film actually feels like Star Wars might be a different place now. Without the substance, certain parts feel decidedly flat – particularly the First Order as an enemy – but there could be so many stories to come that the universe is once again feeling vibrant and alive. I’m finding myself actually looking forward to seeing what will come next, both in terms of forward with the new films, and backwards in filling in the story between VI and VII. In short, it feels like a pretty good time to be a Star Wars fan! I just got home from seeing it too, otherwise I would not be reading this blog entry due to the spoilers haha. I really enjoyed it for a few reasons. 1. It Star Wars. 2. It’s Star Wars. 3. There were a few surprises. 4. It’s Star Wars. I have to agree, the story was like a different spin on New Hope. It fet like I was living in a parallel universe at times with exactly the same things going on in this movie as it did in New Hope. This didn’t at all ruin the movie for me though. I am relieved Carrie Fisher didn’t don the gold bikini thing again though haha, man she has aged badly. I really enjoyed the battle scenes. I didn’t like Poe and Finn’s Bro-Mance haha. The music was amazing, of course and the acting was pretty good I felt. I did like the more subtle throwbacks like when Finn is rummaging through the Millenium Falcon and finds a few familiar relics. Good stuff. The humour was good and not cheesy which could have easily of been the case. It definitely felt more old school that episodes 1 2 and 3 but not as old school as 4 5 and 6. All up, for me, I give it 4 1/2 stars. Mostly because it’s Star Wars haha. Ha! Some good points there – especially like the Star Wars one! The music was excellent, I forgot to mention that. Can’t wait to get the soundtrack! A lot of the story felt like one of the early drafts for A New Hope, with sneaking into a whole world that’s a superweapon and stuff, which was kinda nice. But I really liked the acting too, the humour in particular was a real nice touch. I think I may go again soon, actually! I just have a verbal review to my best mate over the phone and now we are going to see it tonight. I’m also going to see it with a couple of other pals next week. It will never be exactly like the original three movies but it’s still a great effort. It really does feel like the whole thing has been handed over to a new generation of film makers, which was Lord Lucas’s intention. However the new film makers must love the original three movies just as much as the rest of us. Pingback: Star Wars at 40! Previous Previous post: Legions of Death! Next Next post: Christmas week!